This is the big question: How do the researchers come to the conclusion that everyone with the blue eye gene is descended from the same blue-eyed individual? The researchers make this conclusion because 97% of the blue-eyed individuals in their study had the same set of 13 SNP mutations in the OCA2 and HERC2 genes on chromosome 15. The other 3% differed by only 1 to 3 mutations. The argument goes that if the the rs12913832(G) mutation had happened randomly in populations around the world, then it would have sprung up in different haplotypes (that is, the 13 SNPs in the OCA2 and HERC2 genes would be randomly different amongst those populations). Instead, 97% of blue-eyed people tested have exactly the same SNP haplotype at that particular location, suggesting that the rs12913832(G) mutation only successfully arose once and has spread around the world in conjunction with those 13 SNPs. Why are there so many blue-eyed people in the Scandinavia and Baltic areas? rs12913832 is tested by 23andMe, SeqWright and deCODEme (from SNPedia). Pingback: NFL Forum :: - Hey you Blue eyed people! I find it very hard to believe that we all descended from people in Africa. Scandinavian people look and talk very differently to Black people and I think that we three or four different species evolved separately. These are Black, Asian/Arabic, Blonde/Blue Eyed and Chinese. The racial DNA fingerprint is very different for different racial groups. I would love to find out my genetic ancestry. It has been passed down by my Father’s family that we are descendents of Archbishop Stephen Langton who helped to write the Magna Carta (my maiden name is Langton) Please could I win your free competition??? Pretty please, please, please? Patricia – unfortunately, my first contest has been over for a few weeks, but stay tuned because I plan to host another one soon! Historically only people in North of the Black Sea were described as having blue (or light) eyes and blond Hair. Those people were called Saka or Goths, they the Goths claimed they came from Scania. Light eye and light hair are connected to the race Goths who lived in South Scandinavia , they are the R haplogroup for men and the K haplogroup for women, both these two haplogroups shared the mutation for thousands of years and then spread it to other haplogroups through marriage! The Blue eye mutation is concentrated in countries that have high level of R haplogroup (either R1a1 or R1b) such as Europe and East Europe. the mutation needed 80 years of continuous environmental exposure ( such as living on human flesh for survival) as documented by Herodotus concerning Goths , something they learned from their encounter with the Deluge ( great flood in Scythia) at Noah time 6000 years ago! when they started to have to eat human flesh of the dead, their only source of food immediately after the Deluge for survivors! thanks for info very nice May the Force Be With You. At least if you have blue eyes, then things are looking up.Blaineover at Genetic Genealogist covers that family tree. Now I bet Tom Cruise doesnâ€™t feel as special anymore. Other things make us special. The stuff with which we arrogantly called junk, including introns is proving to make us pretty special. All that fuss over an optical illusion. Blue eyes are blue like the sky is blue, Rayleigh scattering. No big deal. All eyes have the same pigment, melanin, which is dark brown. Difference in iris color is the concentration of melanin. 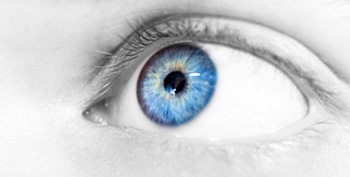 Blue eyes have defective, mutated controllers for melanin production in the iris. Eyes are mostly brown for a good reason. Look up melanin and see how important it is. Very interesting article. I have green eyes and also heard that green eyes are a mutation. This article would support that since it states everyone originally had brown eyes. Still, very interesting topic.